Back in like August, I posted about needing a new bridle for June, as Georgie’s didn’t fit her very well. Turns out June has a horse head needing a cob browband. I ultimately purchased a Passier Blue bridle which I love, and you can read about it in my post June’s New Bridle. But as I hemmed and hawed about what to get, Amanda from The $900 FB Pony reached out and offered to give me her used, but in great condition, Lund Saddlery Eventer Series Flash Bridle . The bridle arrived and I immediately started using it. The only problem was, it didn’t have a browband, so I attached one of my old browbands to it and went ahead and ordered two new browbands from Dark Jewel Designs. New browbands arrived, I attached it to the bridle and womp womp, it was way too big. I hemmed and hawed AGAIN about what to do. 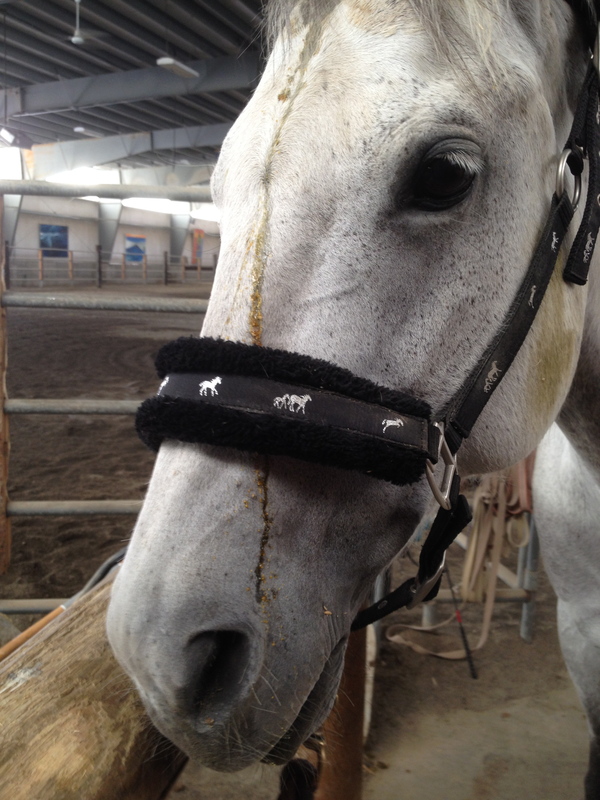 But, it looked just funny enough, that I asked Amelia if I could send them back and have them redone to a Cob browband. In the meantime I had purchased my Passier bridle, but wanted to save that as my ‘show” bridle, at least for SJ, and so I put my mismatched browband on the Lund bridle and just called it good until new browbands arrived. Once they did, I figured I’d write a post thanking Amanda AND showing off the new browbands. Well, the time has finally arrived. So, let’s start here. THANK YOU Amanda for graciously giving me your bridle. For those of you not in possession of a Lund bridle, or unfamiliar with the brand, I really recommend them! This bridle was used, but kept in good condition and when I clean it up, it looks basically new. It has great ergonomic features and is at a really good price point. While I use this bridle for everyday use, I’m also thinking it will become my xc show bridle. And then there are the browbands. I am so incredibly in love with them. They’re purple, but I would put them more in the purple-ish category, which is exactly what I wanted. Plus, because the order was done over the incredibly busy holiday season, and because maybe I pretended to be patient, and waited longer than the average customer would ever have to, Amelia made me a BEAUTIFUL stock pin in addition to the browbands. She even put a 4 leaf clover on the stock pin to match the browband! The attention to detail, and quality of product in Amelia’s designs, can’t be beat. She lets me try to be creative, and design my own, but really, you can look through all the one’s she’s already designed, and in the past I have picked one of those and they were equally as fun and gorgeous. The browbands are interchangeable and you can even purchase a snap on browband which can make switching them from one bridle to the next even easier! So, I now have a bridle I am super excited about, and can’t wait to be the envy of my barn! But in thinking it through, and reading a great article Sarah sent me from horse.com (along with some others) it seems it doesn’t take much for most horses to have ulcers. And probably the biggest contributing factor to her ulcers (which at this time I can only assume are the problem) are that she is “meal fed” as my veterinarian called it. 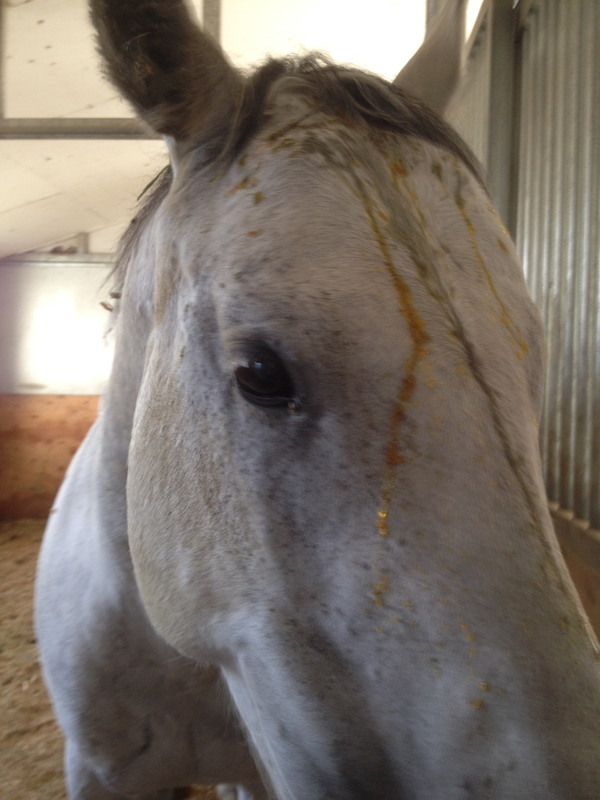 Meaning, June gets two meals a day, and that isn’t great for a horse’s gastric health. Now, I love the barn I board at. But, do I love that my horse spends hours upon hours without anything to eat? No. Especially since I grew up with horses who never had any issues with colic or ulcers and spent their days out on pasture, eating all day long. So, this is tough for me. And clearly, it’s tough for June too. But the good news is, I have some solutions to keeping hay in front of her for longer periods of time, without having to change how the barn feeds her. More on that, later. Having suffered from an ulcer myself this summer, I knew how painful they can be, and also, that eating actually makes them feel better. Along with Omeprazole. I also knew the meds can take a few days to work, and actually, if she doesn’t have ulcers, they would not help a bit. But, by the next day, she was already eating a bit more. And while she wasn’t her complete sassy self, she was feeling well enough to at least get excited about feeding time. And while I had initially thought I would scratch from the dressage show, on Saturday morning, seeing as she was feeling better, I decided to go ahead and ride in the show. I mean, we were doing a walk/trot test and it was at our barn. Stress levels should remain low for all involved. I made a deal that I would keep spurs off and that I wouldn’t fight with her. We’d just go into warm up and see what mood she was in. If she was willing to work, we’d work. If she felt crappy, I’d scratch. She actually felt calm and relaxed. Perhaps a little duller than usual, but with lots going on around her, she was curious, but not anxious. And she handled the little bit of atmosphere like a champ. I definitely could have been smarter about my warm up. I could have done more transitions and worked on getting her to listen to my aids. I did some work on 20m circles and trying to be straight up centerline, which was fine. But I think in general, I just need to go into warm up with a plan, rather than figuring it out when I am already on her back. Especially with a young horse. I was overly concerned with symmetry instead of quality of my gaits. Therefore, our circles were ok, but June was dragging me around, and not listening to my aids very well. Lesson learned. There is a lot of work on transitions in our future. I was also overly worried about connection, instead of riding forward and with rhythm. Rhythm before connection, Nadia. Remember that next time. But connection can look so pretty! But overall? Overall I was thrilled with her. She was focused and willing and a really really good girl. I think with a better warm up plan, and using warm up wisely, I could have imporved a lot of things, but I came out of both tests just thrilled with how it went and thrilled at our potential future. June seemed unfazed by all of it, and was completely ready for treats when we were all done. And while she never gets treats unless she is in the horse trailer or her paddock, I made an exception and was happy to see how eager she was for them. So, all in all, a mixed bag week. I’ll keep you all posted on her scope this Thursday. I guess at this point, fingers crossed we find ulcers? Blerg. But, as always, I have a plan in place and we’ll get through this. Back in Business. Until We’re Not. A week ago I made the drive to pick up June and bring her home. I would be bringing her home in my new to me trailer and was nervous, as she had only driven in it twice, and those were very short trips. This would be a solid 5 hour drive. But, she seemed comfortable in the trailer thus far, and fingers were crossed we wouldn’t have any issues. When I arrived to pick her up she was happily eating hay with the other horses. She heard my voice as I approached her and she turned, pricked her ears and looked at me. While she didn’t come running to me, it was cute that she recognized my voice and didn’t run away. She loaded right up and we were headed out. My truck pulls the trailer incredibly well, and the stabilizer bars on the hitch seem to really help. I didn’t feel any shifting in the trailer, and unlike most times when I haul her, I allowed myself to relax a bit. I stopped about 3.5 hours into the drive to get fuel and check on June. She was happy and comfortable. While she did paw a bit once I opened the door, she wasn’t wide eyed or frantic. Success! I have to say, I’m really in love with this trailer! And it seems June is too! Her first week back started out well. She had been living on about 50 acres, and while I imagine she did quite a bit of walking around, she’s pretty, um, plump, so I figured she’s pretty unfit. Tuesday I did some round pen work and she was very good. She definitely got bored quickly, but I didn’t ask too much of her in her first day. Wednesday I just ran her around the arena and spent some time grooming her. She got Thursday off, and Friday we went for our first ponying trail ride! Thanks to my friend Meg, I rode Smokey and ponied June. June was really, really, good. Not a foot out of place, and she soon realized Smokey needed her space and wasn’t messing around. I was really happy about the entire experience and think June enjoyed herself. On Saturday I stopped by the barn after work, so everyone had left for the day. June was in her shelter despite there being hay in her feed tub. June is typically a hoover, so I was surprised she wasn’t eating. I took her for a walk over to one of the alfalfa fields to see if she’d want to eat. She didn’t, which was unusual. Highly unusual. I brought her to the indoor to see how she would do on the lunge line. She pooped right when we got in, which is normal for her, and stood quietly as I groomed her. She was ok on the lunge line, but a bit lazy. When I took her back to her pen, she went right to her feed tub. I watched her for a moment and figured I would get a call if she was off in the morning. I didn’t get a call and so I was surprised to show up and once again find June in her shelter and hay strewn everywhere. Clearly she had not been eating. I called the barn manager and she agreed that June hadn’t been eating well. Frustrated that no one had thought was strange, I called the vet. Because I really missed emergency vet visits. I’ve given instructions to the barn’s staff to call me if she doesn’t have an appetite in the AM, but I think (as does the veterinarian) it was a mild impaction, and we are on the road to recovery. Poor mare got hauled here, put back into (light) work, new hay, new feeding schedule, all sorts of weather changes and she can’t walk and graze all day long like she was. Sort of the recipe for a colic. The biggest bummer is that I hadn’t started her on Smartpak’s Colic Care yet, so now will have to wait a year in order to sign her up for the program. (If they have a record of colic, they need to be colic free for a year prior to signing up for the benefits). I’m considering getting her insured sooner rather than later, and am considering insuring her for major medical rather than going the ColicCare route. Any thoughts about experiences with great insurance would be appreciated! So there you have it! June’s first week back was anything but boring. I’m hoping to get back in the saddle for some walk rides this week, and hoping we will pick up where we left off (minus the falling off) again soon! I spent much of March riding Georgie, assessing soundness while I asked more of her and got her fitter. The hope was that she would be able to be half leased by a junior rider and she would be able to handle the increased level of work. During the month I went from questioning Georgie’s future to feeling comfortable with her going into work again. It’s amazing what some fitness work and consistency can do for a horse. When Sarah returned from California the beginning of April I could confidently say I felt Georgie would enjoy getting back to work and doing 2′ to 2’3 jumping with a junior. Sarah had the perfect student in mind and, well, now they’re paired up and Georgie is being half leased. Obviously this is hard and weird and sad for me. But don’t worry, I put some stipulations in the lease (cause I can do that, as her caregiver, I guess) and it states in the lease that either Sarah or I can ride the mare once a week to assess soundness (or give her a tune up ride). Despite how strong and sound she was feeling in March, I still worried that the mare would have issue with being ridden regularly. But having ridden Georgie this past week, I can lay those worries to rest. She felt great. I took her for a walk/trot and then just let her gallop, because she was begging me too. It felt great to be back on her and feeling her want to gallop. And while sure, this ride was supposed to be for Georgie, it helped me so much too. When I ride/work with June, I have to be thinking all the time. There’s never really any down time. It was the same with Macy. With Georgie I could just relax and enjoy it. Letting her gallop around the field reminded me why I love riding so much. 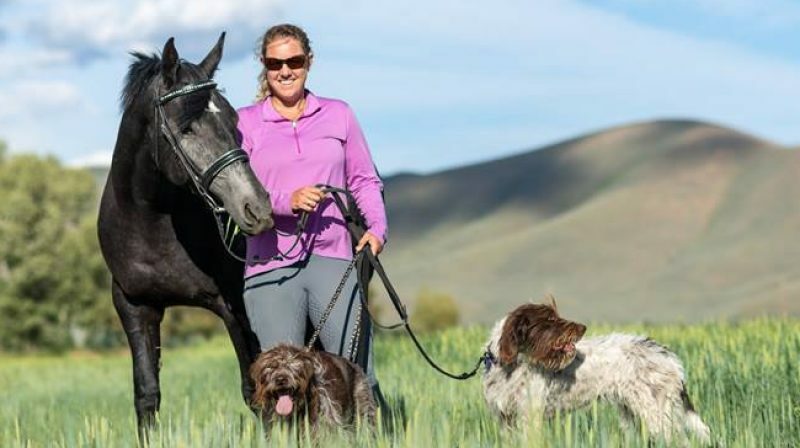 Why a partnership with a horse is such a special thing. I still hope June has half the heart Georgie does. I love watching her new rider love on her and I hope she appreciates just how special a horse she is. I’m so glad she is still at my barn, still in Sarah’s care, and that I’m able to watch over her and ride her as well. Oh, and as an added bonus, she is housed right next to June. She has already figured out that for every treat June gets, she gets one too. So, here’s to a great new life for Georgie, and her teaching another rider just how special a horse she is. I received this text from my Dad while travelling home for Thanksgiving. Nothing makes me happier than some quality horse time. Especially when I get to hang out with the original heart horse, Dublin. But I wasn’t quite prepared for just how bad their manes and tails really were. Apparently it’s burr season in NY. All I can say is thank you to whomever created Laser Sheen. Priscilla’s forelock was definitely the worst. I called it a burr bun. It’s a hairstyle that has not really taken off. A good dousing of Laser Sheen, some tearing apart with fingers followed by shedding blade and the burrs actually came out quite easily. My Dad mentioned he had cut some out earlier, which made me cringe, obviously, but I did what I could to get them beautified. For two retired pasture ponies, whose forelocks have been chopped off, it didn’t come out half bad. Looking forward to having to start all over tomorrow. What’s In Your Medical Bin? Recently someone asked me if I had a certain medical item and for the life of me, I had no idea. It had been so long since I had been in my medical bin that I couldn’t remember what was in there. So, I figured it was a good time to go through it and see what was expired, unneeded or didn’t need to be purchased because I had a ton if it. I was pleasantly surprised by how organized it was! I went through it and again was surprised how many things were not expired! And most of it was in useable condition and stuff I would actually use. I have a lot of bute. In paste,bolus and powder form. Just in case. And a lot of electrolytes. These usually get moved to the tack trunk during competition season, but note to self, I don’t need any more. Some Banamine, Furazone, and lots and lots of wrapping supplies. And huge safety pins. Just in case. In case of what, I don’t know. I also keep my favorite medical book ever in my bin. I use it more to look at pictures while soaking a horse’s foot or trying to pass the time for some other ailment. It’s from the 1990s , or maybe 1980s, but the pictures are AMAZING and it lists like every ailment ever known. I realize my medical bin is missing some important items, maybe epsom salt, betadine, and scrub to mention a few. But I used to be a vet tech at my current job, so I have easy access to many items I may need right away. Oh! And I do have a stethoscope, but it’s in my cubby where I can easily grab it, so isn’t pictured. So tell me, what’s in your medical bin? I’m one of the lucky ones who grew up riding ponies as a child and learned much of what I know about horses from a young age. But it’s the horses I had in young adulthood through the rest of my life that seem to have had the most influence on me and who I’ll never forget. 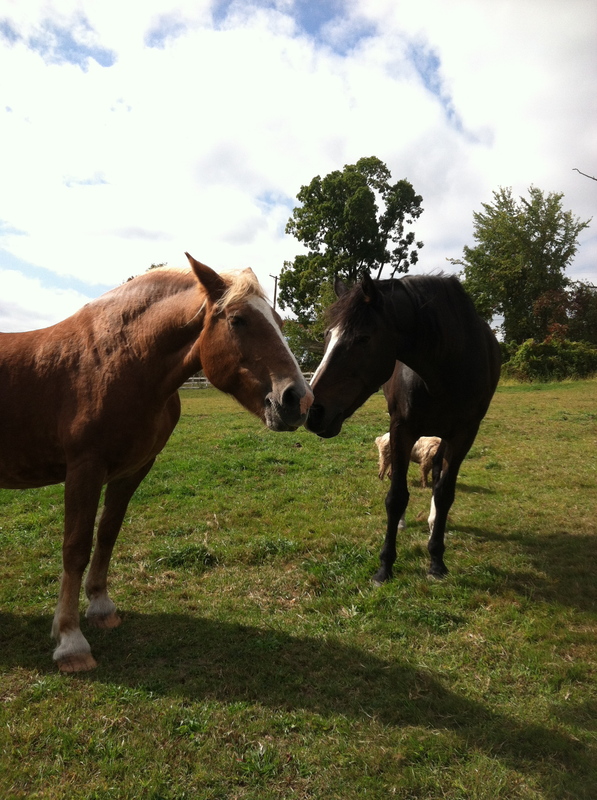 Here are the horses who helped me become the rider and person I am today. It started with Watch Me. I had outgrown my pony Little Bit, and my father, being a bit wiser than I gave him credit for, decided to purchase a new horse for himself and handed down his trusty foxhunting packer to me. Watch Me had already been in our family for quite some time, and I always remember the story that was told to me when we would see his trainer at hunter paces. Watch Me was competing at Madison Square Garden on a stormy evening. No horse had had a clear jump round and Watch Me was the last to go. As he took off for the last jump, the lights in the entire building went out. The crowd was silent until they heard Watch Me land and then erupted in applause as no rail dropped. Watch Me was the only clean round of the evening. I have no idea how true this story is, or how my Dad acquired a horse like Watch Me, but apparently the barn he was at had no need for horses that could jump in the dark. 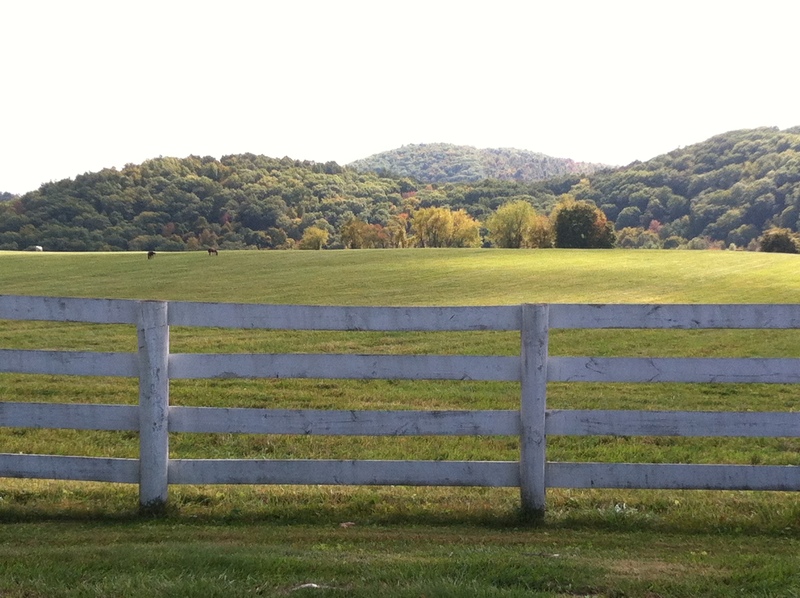 I had Watch Me during high school and I would take lessons at the Millbrook Equestrian Center. I had a crazy Irishman as my instructor and it was clear to him and probably everyone else that despite the lack of talent on his back, Watch Me would jump anything. At one lesson my instructor just kept raising the jumps. And we just kept jumping them. I looked over and the entire viewing box was full of spectators. And I know they weren’t watching me, but it was still a memory I will never forget. My senior year in high school Watch Me was kicked by another horse and he never fully recovered. His advanced age and years of jumping made it so an injury meant it was time to retire. So, Watch Me lived into his 20s on my Dad’d farm until it was time to say goodbye. Seeing that I wasn’t going to give up riding, my Dad decided to hand Mouse down to me, the horse he had purchased when I took the ride on Watch Me. We never could figure out if Mouse got his name because of his color or because he was scared of everything… By the time I got him from my Dad he was a solid horse with lots of go. 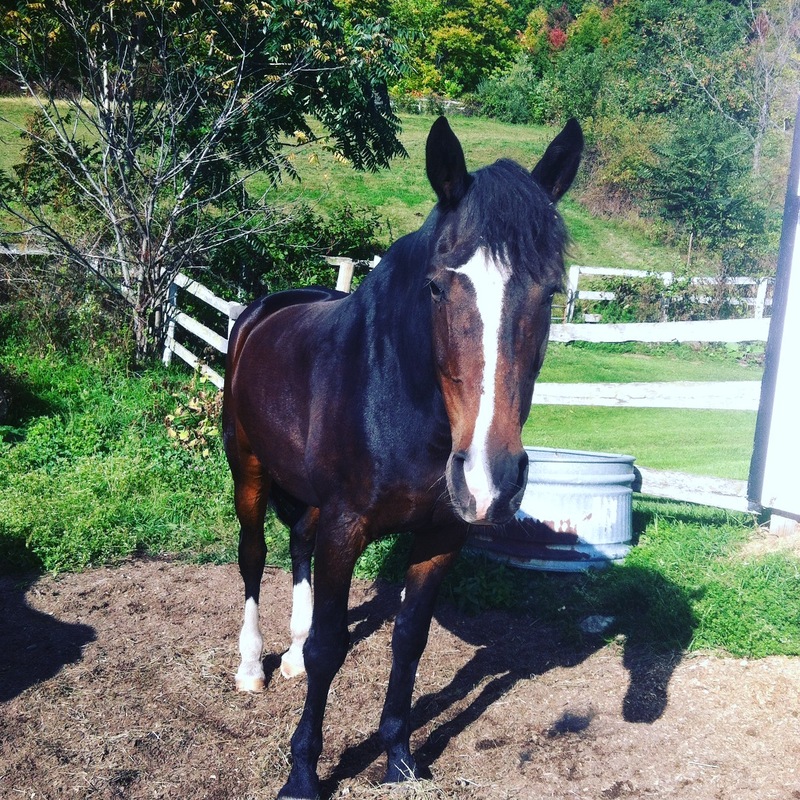 My Dad purchased him as a 6 year old from a farm in Vermont. He was an Appendix Quarter Horse that was bred to fox hunt and jump. While Mouse loved jumping and foxhunting, he was really game for just about anything. 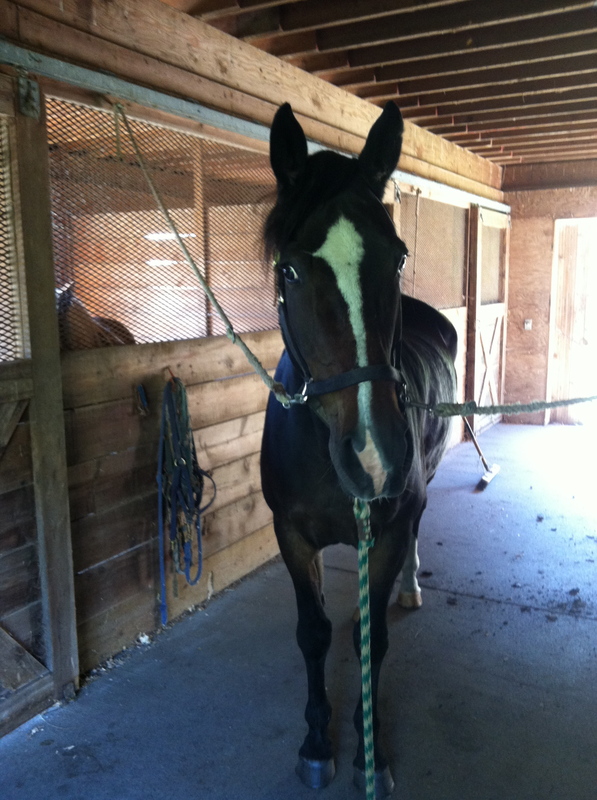 I took him to college with me where we dabbled in dressage and did a lot of trail riding. He was an all around great horse and great athlete and the perfect horse for me, a college student who just wanted something fun and safe to ride. Mouse lived into his 30s on my Dad’s farm and sadly we had to put him to sleep earlier this year. 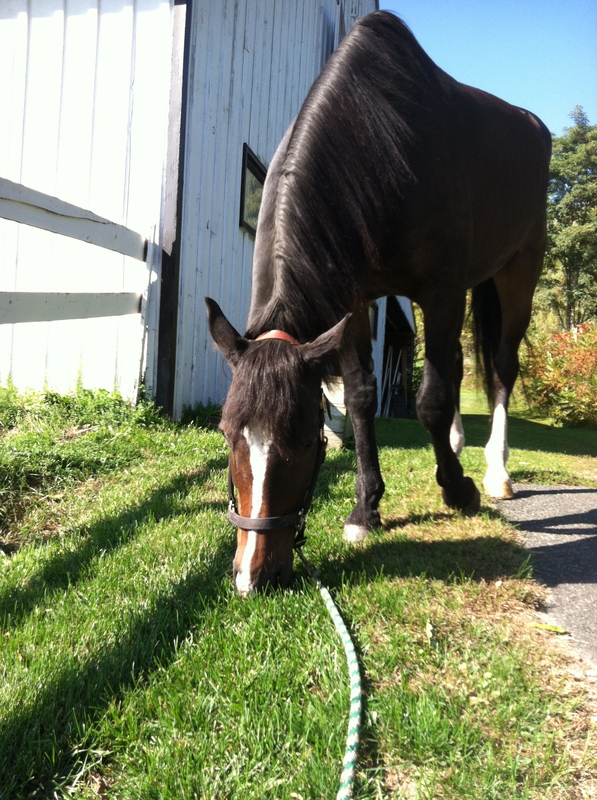 When I moved to Ithaca NY I adopted a horse from the Cornell Vet School, where I was working. My biggest worry about Brigadoon at the time was that he wouldn’t be sound. He was sound. And also a rearer. We had a short lived relationship. I gave him to a woman who was able to break him of the rearing and last I heard he was doing well as a jumper. Brigadoon made me realize I wanted a horse that would be fun and not a project. I didn’t have the time or capability to deal with a horse with dangerous issues. So my Dad saved the day again. He had recently been given a horse from a well known jumper barn in our area. This barn was known for importing Irish horses in as jumpers. It’s also where Boyd Martin frequents and gives clinics. I like to think that Boyd knew Dublin, but I doubt he ever did. Dublin, the horse my Dad had been given, had broken his pelvis jumping but was still “sound” to walk, trot and canter. That sentence was difficult to write for many reasons…. Anyway, I quickly fell in love with Dublin. He remains to this day one of the kindest horses I have ever met. He is the reason I love Irish Sport Horses and why huge bays with blazes will always have a special place in my heart. He was the perfect horse at the perfect time. He reminded me that riding could be fun and not scary and that horses were kind and easy to be around. Dublin moved to Idaho with me and we trail rode and had fun for about a year before he re-injured himself and we called it quits for good. In the summer of July 2014 my friend Sarah and I took the road trip of a lifetime and drove Dublin back to the family farm in NY, 4 years after I brought him to Idaho. Because who doesn’t drive their 19 year old retired horse across the country? Dublin handled the trip with dignity and grace and made me fall in love with him all over again. He’s now happily living with his girlfriend Priscilla, a Haflinger/Belgian x. Trail riding in Idaho. So glad I had him with me here. So, with Dublin retired I, for the first time in my life, could go ahead and buy a horse and not get a hand me down! So, just like any stupid first time horse buyer, I jumped on Dreamhorse and bought a horse because she was pretty. Kilkee was being sold because she was “too much” for her owner (red flag #1) and she was greatly reduced in price because she failed her pre purchase exam (red flag #2), but she was pretty and a draft x and in my price range. So I bought her. And man did I get lucky. While at first Kilkee proved to be a challenge (she bucked when I asked her to canter) she ended up being one of the most solid horses I have ever had. She was an amazing horse to event and we had a fair bit of success at the Novice level. She got me comfortable jumping again and was tons of fun out on xc. But, when I was ready to move to Training, it was clear Kilkee did not want to make the move with me. She would have tried, as that was her nature, but she wouldn’t have been happy, and probably wouldn’t have remained sound as jumping 3’3 was a struggle for her. Knowing that I wouldn’t be happy staying at Novice I made the decision to sell her. One of the hardest but best decisions I ever made was not to ask more of Kilkee than she wanted to give me. I sold her to an adult amateur who I think also bought her because she was pretty. But they’re a great match and Kilkee is living the life in Kentucky being spoiled rotten and running around at Beginner Novice. And now I have Georgie. And while she has an owner and I am leasing her, in my mind, she’s one of my horses, and she always will be. I’m incredibly lucky to have her. I know you have horses that have shaped you and made you the person you are today and I would love to hear about them! So dig up all those old pictures and take a walk down memory lane. I’ve just gotten back from a great trip visiting family and friends back east. My trips back always involve lots of traveling in order to visit as many people as possible and I am glad I took a full week to do so this time. I got to spend some time with my retired horse Dublin, who Sarah and I drove back to my family farm July of 2014 after he re-injured himself and was no longer sound to ride at all. Dublin had never been completely sound when I had him. He couldn’t jump, but we could do lots and lots of trail riding. He’s a large Irish Sport Horse and has made me fall head over heels in love with that breed. He’s 21 years old now, so I’m not sure they make them like they used to, but I’m hopeful I’ll have horse just like him (but sound) one day in my future. She is an enormous Haflinger/Belgian/something. Verdicts out as to whether she is an overgrown Haflinger or an undergrown Belgian. She has the waistline of a Belgian with the legs of a Haflinger. And trust me, we all know she is grossly obese. But my Dad refuses to go the grazing muzzle route and she’s been doing well looking like this for 6 years.. so it’s tough to argue with him. She was given to him when her owner was diagnosed with brain cancer. People (including me!) seem to know my Dad will take in the old unwanted horses and give them a pretty great life. I’m lucky to have him as a role model for how to treat animals. It was great to be back on the farm and enjoy the beautiful countryside where I grew up. Millbrook NY is known for fox hunting, eventing, jumpers and pretty much everything equestrian, and every time I go back I pine for galloping for hours, jumping coops between the fields. I’ve been back in Idaho about 3 hours and have already been out to visit my girl Georgie and get a short ride in. Only 2 more lessons until Galway! We have a local jumper show this weekend and then I’ll get to the task of packing and organizing. I’m officially entered and therefore officially VERY excited. One more pic. Because he is so handsome. And I miss him. On Tuesday I headed to the barn to work on all the things Sarah had Georgie and I work on in our lesson Monday. But when I got there her forehead was slightly swollen and she had this weird swollen vein on her neck. (We never found out why this vein was swollen) I showed Sarah and she suggested I call a fellow friend eventer who is also a vet. Georgie was happy to eat and seemed fairly bright so I made an appt for the vet to come the following day. I took her cribbing collar off for the night and lined her stall with towels so she had nothing to crib on. The following day the towels were miraculously still intact and Georgie’s swelling had gone down. 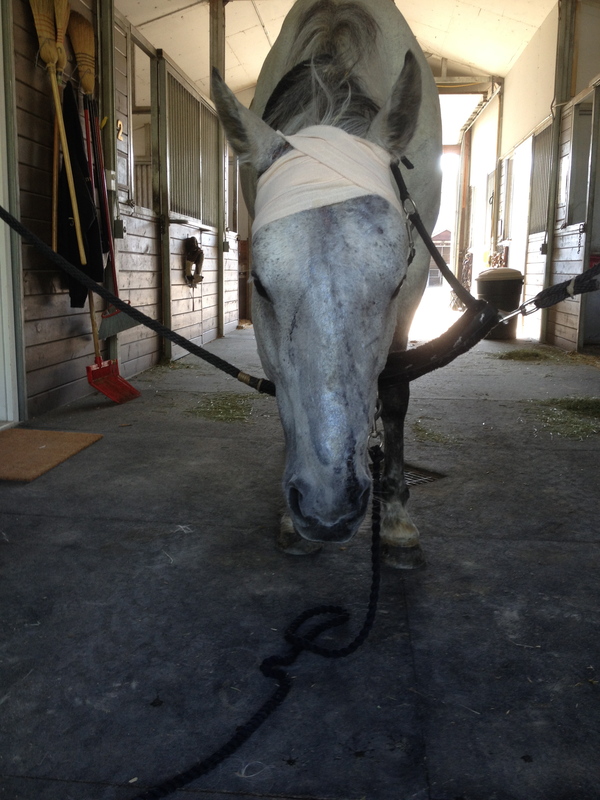 A small wound was found right where the forelock meets her head. Perhaps a rub from the collar? Or a puncture? I was told to keep the collar off and if she continued to improve I could ride on Thursday. Thursday she looked and felt good and I was more worried about the cribbing than the wound as she had destroyed the towels and was back to her usual antics. Then yesterday, Saturday, she had gross serum pouring down her head and it seemed a bit more swollen again. So I hosed the serum of, let her graze while I did some other things and figured I’d check her again this morning and if it was ok we could go on a conditioning ride before it got too hot. Saturday- a litte serum which got on her new halter that my farrier said “Looked like something a 12 year old girl got for her first pony.” Whatever. I love it. On my way to the barn at 7am the barn manager calls me. Georgie’s face is covered in serum and incredibly swollen. I explain I am on my way down and call the vet. Vet came out and sedated Georgie. We worked on removing serum which was sticky like dried honey and as we pulled it off, her hair came off too. And her forelock, that I had been working SO hard on growing out since I clipped my bridle path a bit too forward this winter, started coming out too, as we pulled serum out of it. After lots of scrubbing, IV antibiotics and anti inflammatories, we scrubbed some more. And then Georgie got the biggest insult of all. A wrap to keep a poultice on the wound. Event pony? Not anymore. She now looks more like a patient post plastic surgery. We discussed how this may have happened and the vet feels that yes a puncture wound is possible, as is a spider bite. (We then discussed snake bites in horses which was fascinating, but definitely not what happened to her..) Regardless, as long as antibiotics do their job we should be good to go soon. I don’t know what “soon” means, but am hopeful it means REALLY soon. I know we all love horses and can’t imagine our lives without them, but man, some days, I wonder what life was like before I made emergency vet calls on Sunday mornings and had to spend my days wrapping the head of a horse who suddenly becomes a giraffe. Fingers crossed we’re able to get on later this week and ride, and that Georgie resembles less of an ogre in the coming days.